While reviewers are hard at work putting together the schedule of talks and tutorials, and we recently closed the window for early submission of lightning talks, there's still another way for you to present at PyCon: the poster session! 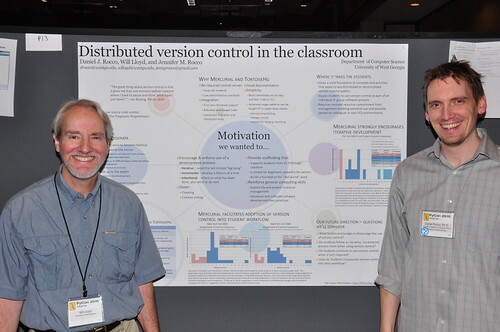 The poster session got its start at PyCon 2010 in Atlanta and quickly grew into a very popular event that we're happy to have on the schedule once again for PyCon 2014 in Montreal. We're accepting poster proposals through November 1, so put yours together soon! On Sunday April 13, the last day of the conference, the poster session takes over the expo hall area and offers a great way for people to share their latest projects and ideas via poster. While the presentation medium is low tech, the presentations have been anything but low tech. We've seen some really interesting projects presented over the years, and the makeup of the event has lead to some great conversations that we're still thinking about. Chad Cooper wrote a nice post about the session for PyCon 2013, and we have an FAQ page up on our site at https://us.pycon.org/2014/posters/faq/. The full details of our poster proposal process are available at https://us.pycon.org/2014/posters/! If you haven't registered for the conference yet, we're still within the early bird pricing, with discounts of up to 25% off! See https://us.pycon.org/2014/registration/ for more information and to buy your tickets today. If financial aid would help make your trip possible, check out https://us.pycon.org/2014/assistance/ and apply!